Product Features Multiple protection: 3DESkey management LED lights: Light after startup flashing, normally on after connecting the bluetooth. Safe and simple: Security algorithms, hardware encryption,client and hardware perfect match just pay a brush. Interbank real-time: Real-time debit transactions,a variety of business real-time arrival. 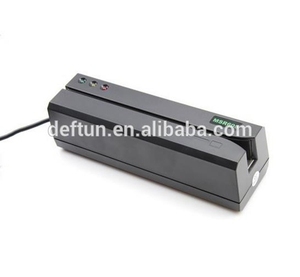 Data Collection Intermittent Data Collection Interrupted function Battery rechargeable Mini size: 10.4*5.8*2.5mm 1track, 2tracks, 3 tracks can be customized as your required. Introduction MSR009 is Portable Data Collector With the smallest size. 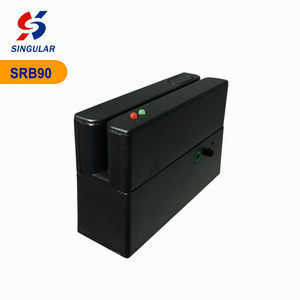 It's a portable magnetic swipe reader, which is specially designed for magnetic stripe data collection anytime and anywhere without Large memory can collect 32000 data. Ltd was built in September 2007 by a group of senior experts who in love with technological research and development. The main business covers financial electronic equipment, commercial R&D, electronic products manufacture and the OEM/ODM services of related products. 2, What's the mini MOQ9 Our factory support mini order, 10pcs is acceptable, but the unite price is based on quantity, quantity is bigger, price is cheaper. 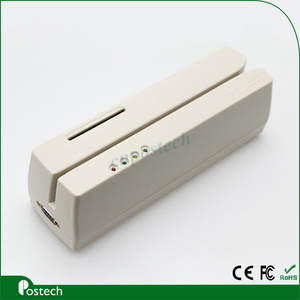 Mini Portable Magnetic Stripe track 1,2,3 Card Reader reprogrammer MSR100 Magnetic Stripe Card Reader MSR100 can read Track 1, 2 and 3 hi/lo-co magnetic cards in Bi-direction and is designed to offer a card reading solution for ISO 7811/12 formats. Fetures With indication of light Low power consumption, good compatibility ISO 7811/12/13/14 Easy Programmable RS232/PS2/USB Cards can be swiped and read in both directions. Readers can be affixed to most computer keyboards or to any flat surface, Can be connected to any PC or Mac via keyboard wedge or USB interface. Q2. The device can't be turned on l Check the power adapter, or change another workable power adapter. l Check whether all the weld point of the SIM card slot is welded well. Otherwise, open the shell of the device, and check if the antenna is connected well. 4G Smart Payment Portable Android Mobile POS Terminal With NFC Reader HCC-Z100 General &Oslash; The HCC-Z100 is the cutting-edge secure electronic payment terminal powered by safe- Android 5.1 operation system. It comes with a 5.5inch high definition colorful display, industrial level thermal printer and flexible configuration for various barcode scanner scenarios. &Oslash; Empowered by Quad-core CPU and massive memory, HCC-Z100 enables exceptionally fast processing of applications, and supports additional features for local customization including fingerprint scanner and fiscal module . Alibaba.com offers 569 portable msr products. About 37% of these are pos systems, 6% are card reader. A wide variety of portable msr options are available to you, such as memory stick card, cf card, and mmc card. You can also choose from all in 1 / multi in 1, single. As well as from external, internal. And whether portable msr is paid samples, or free samples. There are 574 portable msr suppliers, mainly located in Asia. The top supplying countries are China (Mainland), Hong Kong, and Taiwan, which supply 76%, 21%, and 1% of portable msr respectively. Portable msr products are most popular in Eastern Europe, South America, and North America. You can ensure product safety by selecting from certified suppliers, including 67 with ISO9001, 51 with Other, and 8 with ISO14001 certification.